Posted on 9/12/2009, 2:55 pm, by nule, under Software Updates. A user from the support forum indicated that they were using custom clients, logic and even HL7 ack logic and wanted to include custom jars with their HCM instance. This didn’t really work like they wanted because of the way that the classloader works with Tomcat (and other app servers). I added a custom classloader for all Integrate Client Library (ICL) applications, and have HCM using it which allows you to specify a jarUrls property in the client config to add your jars to the classpath. See here (towards the bottom) for information on how to do that. 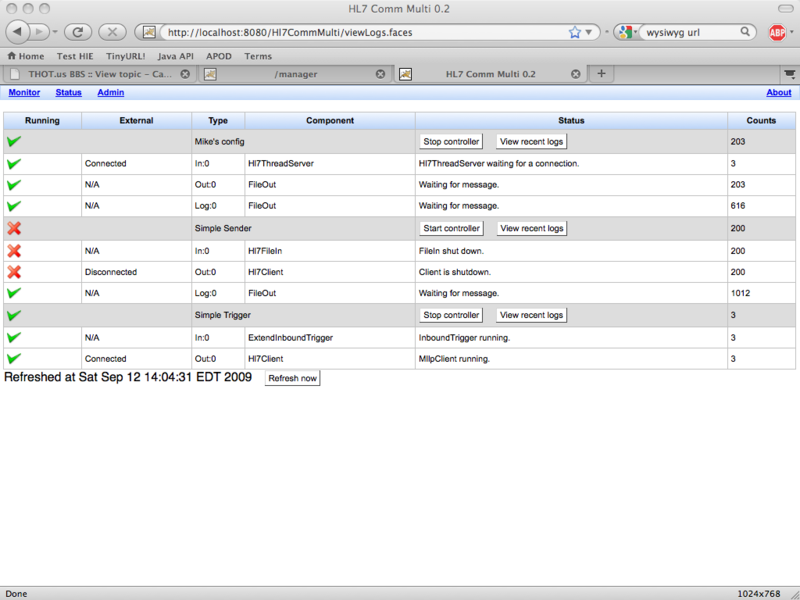 This version, 0.3, also will display the external connection status where applicable (i.e. TCP/IP clients). Once I make sure this code works OK with HL7 Comm, I’ll be releasing both versions (including a GUI for adding additional jars to your config with HL7 Comm), as well as all the updated library jars and the like. The documentation is going to need a few updates as well.